The short, conical bill and streaky plumage of our quiz bird look good for a sparrow of some kind. Cutting to the chase, the orange supercillium or "eyebrow" is found on only 2 species of sparrows that occur in Illinois, namely Nelson's and LeConte's. These 2 Ammodramus sparrows are regular migrants through our state and are very similar in appearance. Fortunately our quiz bird is positioned in such a way that we can clearly see the nape and back, important areas to focus on when attempting to separate Nelson's and LeConte's Sparrows. Starting with the nape, Nelson's Sparrow has an unstreaked grayish nape, while the nape of our quiz bird is finely streaked. Both species have streaked backs but the streaking on Nelson's is finer and white. The back streaking of our candidate is broad and buffy in color. Also note the pale edges to the tertials, which are typical of LeConte's Sparrow. 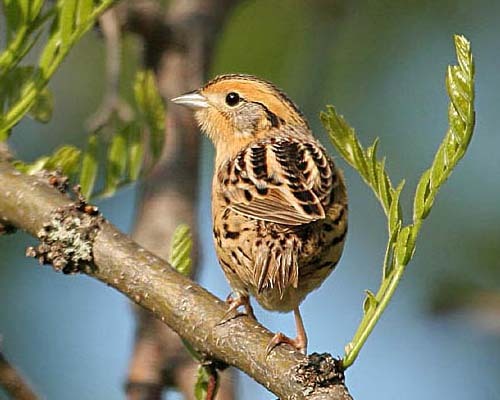 This LeConte's Sparrow was photographed by Kanae Hirabayashi at Montrose Point in Chicago on May 17, 2007. Compare this bird with the Nelson's Sparrow in the Late Spring 2009 Photo Quiz.